4Jesus answered: "Watch out that no one deceives you. 5For many will come in my name, claiming, 'I am the Christ,' and will deceive many. 6You will hear of wars and rumors of wars, but see to it that you are not alarmed. Such things must happen, but the end is still to come. 7Nation will rise against nation, and kingdom against kingdom. There will be famines and earthquakes in various places. 8All these are the beginning of birth pains. That seems a little different; we are, after all, living in a fallen, dying (dead?) world. Look at the chart (if you don't see it, you may have to go to the original blog post - click the pic to make it bigger if you can't see it very well, then press "back" on your browser to return here). What does it look like to you? 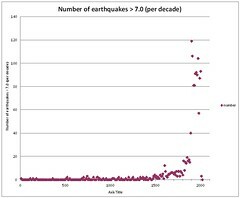 The number of "major earthquakes" appears, based on data from the National Geophysical Data Center's Significant Earthquake Database (the specific search was for all quakes greater than 7.0 magnitude from year 1 to year 2010), to have been on the rise since, oh, the 1600s, and really on the rise since the 1800s or so. (As a note: I don't think we can really count "total number of earthquake detections" as 1) the number and dispersion of seismometers; 2) the sensitivity of seismometers; 3) the global communication necessary to report events worldwide have all been increasing, significantly, over the last century or so.) So, does this mean "we're nearing the end?" There are plenty of proponents of that (such as here). I'm not saying one way or the other; what I'm doing is offering data so that you can come to your own conclusion (although there may be some personal thoughts somewhere along the way). Jesus said (John 8:32, NIV), "If you hold to my teaching, you are really my disciples. Then you will know the truth, and the truth will set you free." Note: I am NOT suggesting that what I'm saying is, or is equivalent to, the teaching of Jesus! I'm just offering data. When it comes to Christians trying to live as a witness to The Truth, that is, the Gospel, the Good News, the Love of God for a lost and fallen world, I think we do well to make sure that, as much as possible, we know the facts, get the facts straight, and don't offer views based on incomplete or incorrect data. Some will be turned off by such inaccuracies, lumping our knowledge of the Truth in with our knowledge of the facts, and thus we might turn away one who otherwise might have listened (and, again, I know it's God's spirit that does the convincing, but we're also to "study to shew thyself approved." Anyway... so, the number of major earthquakes is on the rise. Or is it? Where do most major earthquakes happen? Pacific rim: western Americas, Pacific Asian nations. Yes, there are a few outside of that (Haiti & Turkey, for instance, although Turkey's recent quake was a 6.0, not a 7.0 or greater), but the majority occur somewhere along the Pacific plates (Pacific tectonic plates, not your fancy Pacific dishware). And, from a westerner's perspective, when did we start living in such places? Probably around that time frame, the 1800s. And around that time was also the invention of the telegraph, along with other increased communication methods, such as with the Pacific Asian nations. So, to what would all this lead? Yep, an increase in the number of perceived major earthquakes. Not necessarily an increase in the number of earthquakes (unless all those new Californians suddenly took up the sport of synchronized jumping, which, knowing Californians, I wouldn't necessarily find totally unbelievable). Thus, the apparent number of major earthquakes just might increase significantly around that whole time frame (the 1600s? well, there was increased trade with the Asian nations around that time frame, right? hence increased spreading of "news" such as major earthquakes). Now, all that being said, here's another question: if Jesus was, in fact, indicating an increase in the number of earthquakes - was that a literal number of earthquakes or the perception of earthquakes, which could stem from increased seismic monitoring, increased population and better communication, and increased large, man-made structures and roads that would be damaged by such quakes, leading to increased damage reports? Is there a distinction, and does it matter? Or, in fact, was Jesus just saying, "Guys, this 'stuff' all around you, it's only the beginning; it doesn't even compare to what's coming in the end!"? In short, my point is simply: know the data, make up your mind, and then, when people ask you about the data, you'll already have some idea on how to answer. Completely unrelated, my daughter just asked, "Why are the scissors magnetized? Is it from sitting near my laptop?" Could be. Interestingly, I noticed, when looking at the Fiskars website, the company is over 360 years old! They were founded in 1649. Wow. They are from Finland... no earthquakes there - so maybe it is related. Anyway, there you go... comments welcome. Why are the scissors magnetized? Good question: I have several possible answers. 1) They are intended to help people who work with metal things, like needles or snipping tin, to help pick up the little metal things (like spilled pins or to keep metal shavings "stuck" to the scissors while cutting). 2) Depending on where they were around the computer, it IS possible that there was such a field generated that magnetized the scissors. Personally, I don't necessarily think either answer is correct, and have nothing else to offer right now. It's a blog post in the making...get to work!